The electromagnetic spectrum represents the domain of all possible frequencies by which electromagnetic radiation can propagate. 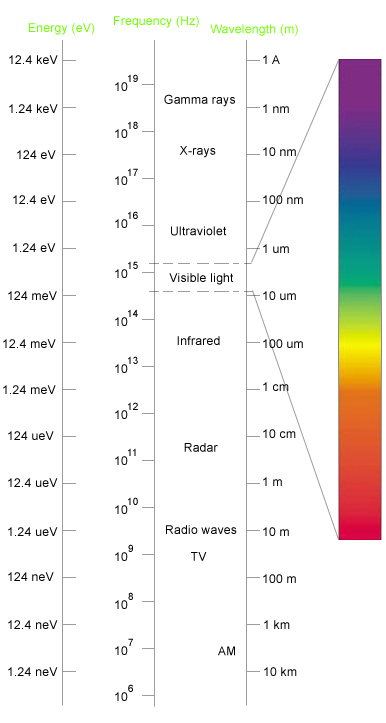 The electromagnetic spectrum can be divided up into a number of distinct regions. Spanning an extensive range, the spectrum encapsulates, gamma rays, the most highly energetic radiation ever detected, which is associated with the eradication of the most massive astrophysical objects in the universe, to the medical doctors x-rays used for the detection of fractures in the bones of your skeletal system, through ultraviolet which is responsible for sunburn, to the visible portion, which is capable of stimulating photon-senstive cells in the retinal membrane of the human eye, through infrared which produces the sensations of ‘heat’ on your skin, microwave radiation which is used for example to cook your food, and finally radio waves which we rely on for communications. Whether taking the form of a gamma wave or a radio wave, all forms of light share wave-like properties. All waves undergo oscillation in a periodic fashion, with a characteristic amplitude, polarisation, wavelength, and frequency, that together define the direction, energy, and intensity of the radiation.